The Sandman thread is entirely removed from SPIDERMAN 3 in order to create a tighter movie focused on the three friends (Peter, Harry, MJ) – with Venom as the Dark Side enabler and ultimate villain. 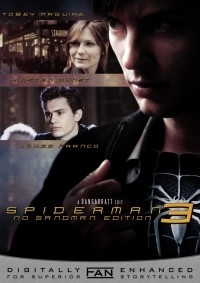 Inspiring stuff going on here (fanedit.org) prompted me to think about a movie which had a lot of promise but ultimately didn’t deliver: Spiderman 3. I’ve always felt the problem was too many disconnected stories going on – for one, there are THREE bad guys in the film (Goblin Jr, Venom, Sandman). Sandman, although brilliantly executed, always felt like a story running parallel to the rest of the movie. Goblin Jr has been a long time coming, Venom is necessary for Peter Parker to mess things up (for him to face his Dark Side) – but Sandman’s connection is a very tenuous “Oh actually THIS guy killed your uncle”. So, I have removed the Sandman thread entirely, in order to create a tighter movie focused on the three friends (Peter, Harry, MJ) – with Venom as the Dark Side enabler and ultimate villain. Movie is now 90 minutes long, and much tighter, and character-focussed, like the first two movies. Venom becomes more central to the plot, and Peter’s descent is more brutal. Pacing is greatly improved over the original. 53:55-56:22 Venom takes over while Peter sleeps. Cuts that are a little abrupt have been soften by cueing the next scenes music early ... or even combining the two scenes music to give an audio prep for the cut. This is truly an underrated and utterly spectacular fan edit. While still not the best of the Spider-Man franchise, this is now on the level of the first one. Even as I first exited the theater, I realized how utterly extraneous Sandman’s character was and how it truly felt like he was stuffed in there for good measure. Sandman simply didn’t belong in this movie, and the editor realizes it. Without him, this is the far more introverted and personal film that Spider-Man 3 should have been. Peter finally has to face dealing with his own life (not just Spider-Man’s); this deals with the consequences of his actions and the emotions he feels. In a way, the symbiote just represents his darker personas that he needs to conquer in order to live full life. With no focus on the Sandman, the audience can realize that. This edit has a number of pluses too. The character relationships do seem stronger. We get to focus on Peter’s love/hate relationships with Mary and Harry. Also, the toned down action of this edit really emphasizes the character driven nature of this movie. Even Topher Grace and “Emo Peter” don’t seem as annoying here, they’re typical “comic book” aspects coming to the silver screen. That rubbish plot about Uncle Ben is also gone; I never understood why Raimi, as a fan of the comics, would violate them like that. As a side note, thank you for keeping Bruce Campbell; the man’s just flat out awesome. This edit is flawless technically in terms of removing Sandman. There are no awkward references to him at all. Audio is crisp and video is immaculate. If ever I want to see Spider-Man 3, without a doubt, I will go to this edit.